Leo December 2018 Horoscope predicts that the emphasis will be on psychological issues and family affairs. As most of the planets are in the southern sector of the horoscope, career and personal ambitions will be on the back burner this month. Leo personality will be more preoccupied with the past than planning for future development. Almost all the planets are situated in the western half of the chart in December 2018. You have to keep the interests of others in mind and cut down your assertiveness. You are dependent on social skills and you must have the support of others to accomplish your goals. All the planets are in forward motion by the end of the month of December 2018. Things are happening swiftly and growth will be very fast for Leo zodiac. The Lunar Eclipse of the 10th will put friendships under trial. Elders are changing their financial strategies. Your spiritual organizations and methods will undergo radical modifications during the Mercury retrograde. 2018 December monthly horoscope foretells that career requirements will be tough after the 22nd. You have to cope up with the frantic pace at the workplace in December 2018. You are improving the prospects of your career with the help of social contacts. If you are seeking employment, you will be successful after the 23rd. December 2018 astrology for Leo forecasts that monetary situation will be fabulous all through the month. Money comes from your professional sources and earnings will be better before the 12th. This period is also good for speculative investments. You have a tendency to spend more during this period. After the 12th, your financial acumen is better and you can make large procurements during this time. Relationship Forecasts predict a splendid period for love and relationships and pregnancy in the month of December 2018. There will be plenty of socialising and entertainment. You like to hog the limelight and be socially popular. Singles will have opportunities to form love partnerships after the 22nd. Leo sexuality will find love in your workplace, probably with a colleague. You can check your co-worker compatibility test. December 2018 horoscope for Leo foretells that health will be superb this month. Your energy levels are very high and you tend to over-indulge in bodily pleasures. It is advisable to be cautious and conserve energy. With good health, your attractiveness also will be enhanced. 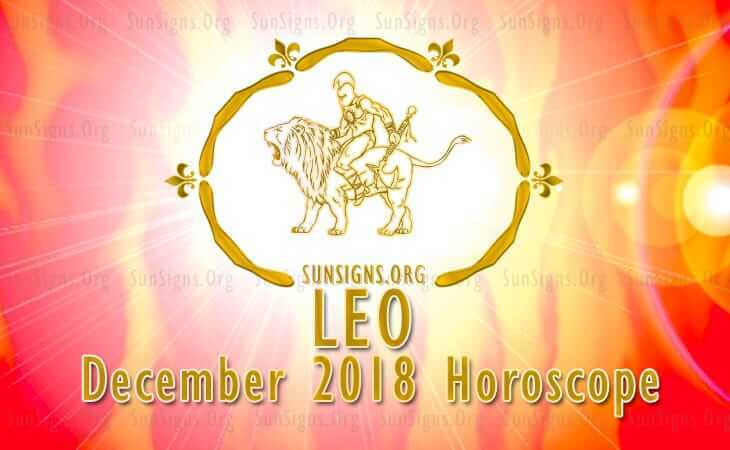 December 2018 predictions for Leo promise a splendid month for love relationships, health and financial growth. Professional life will be quite tough. Just look into Numerology 2018 horoscope.